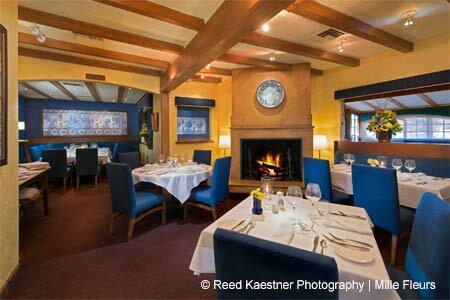 French-California cuisine by executive chef Martin Woesle in Rancho Santa Fe. : Mille Fleurs offers seasonal cuisine with French influences and a topnotch wine collection. Located a mere mile from famed Chino Farm in Rancho Santa Fe, the place employs its products as well as other fine ingredients. Chef Martin Woesle prepares such dishes as lobster soup with Cognac; swordfish with pink peppercorns, mustard-vermouth wine sauce and a vegetable medley; and Diamond Ranch quail and “Foie Gras” with Yukon potato-prosciutto cake, Bing cherries and orange-ginger sauce. The chef's signature “Wiener Schnitzel” of veal loin is another longstanding selection. A casual bistro menu is also available, reflecting Mille Fleurs' shift to a more relaxed style of fine dining. But there are the prix-fixe five- and seven-course extravaganzas, too, that showcase the talents of Woesle. Long frequented primarily by an older, equestrian set, Mille Fleurs has gained popularity with younger foodies and folks outside of Rancho Santa Fe. Service is suave and professional, while the atmosphere is formal but not overly stiff.